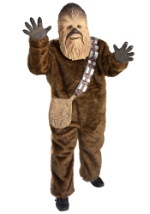 You can have the best Star Wars costume around by wearing this pair of Chewbacca hands. The hands are made of latex and have authentic wrinkle detailing, painted-on fingernails and textured hair. The gloves measure at 7" across the palms and 14 ½" long. Make your Wookie costume something to talk about by adding this pair of Chewbacca gloves.